Ever shop around at the farmer’s market with great intentions, filling your basket with loads of colorful veggies with grand plans for dinners and then forget about them? I’m just proud that I made it to the farmer’s market most weeks. Here’s me after biking to the farmer’s market a few weeks back. I’m loving the summer tomatoes. Fast forward 5 days and those organic heirloom greens are wilting away in the drawer in your fridge. Yeah, I’ve been there too. And more often than I’d like to admit. Truth is, you won’t do better next week unless you make it a priority. 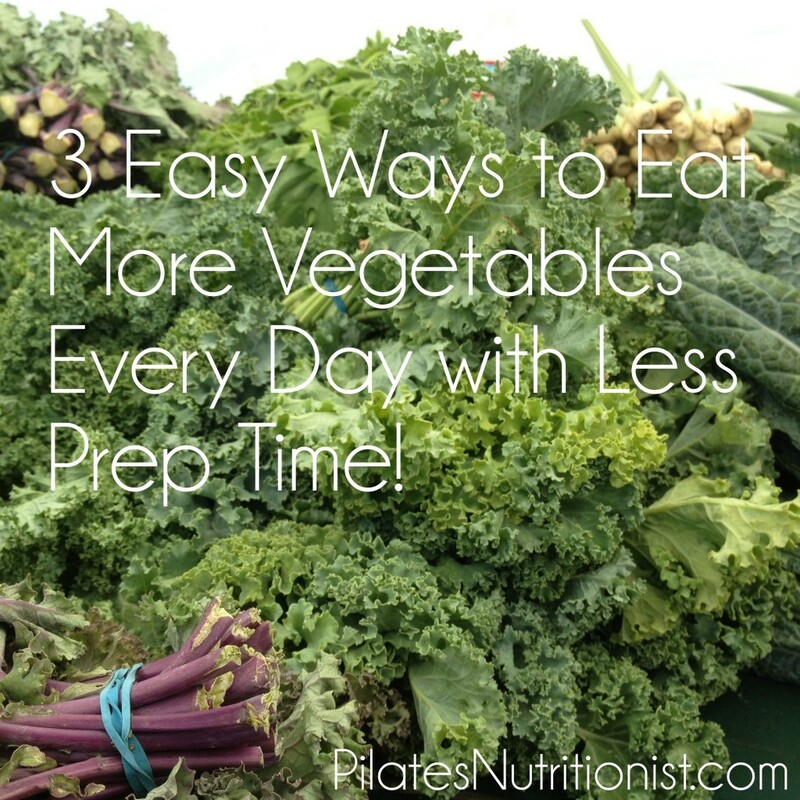 Life gets in the way of everything, especially finding time to prep fresh veggies. A late night at the office, an unplanned dinner out, impromptu family or friends appear at your house… You know the drill. 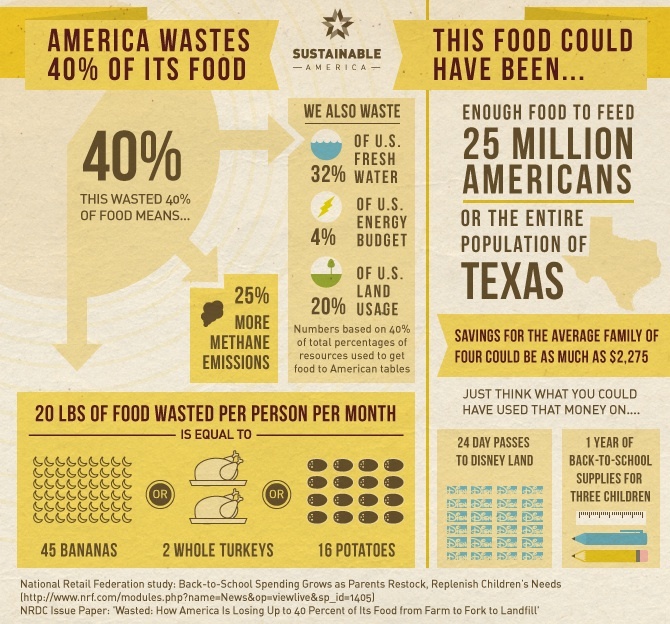 And not to make you feel any worse about that rotten bag of spinach, but America collectively wastes 40% of its food. That’s an unfathomable amount of waste and we must take some personal responsibility here. This infographic from Sustainable America lays it out pretty cleanly. Regimented schedules and meal plans fail time and time again, so you’ve got to find some middle ground between eating healthy and living your life (and trying not to destroy the planet in the process). These are my 3 favorite ways to eat enough vegetables every day of the week, even when I *feel like* I don’t have the time. My biggest excuse for not cooking vegetables is that it takes too long to wash and chop (and takes up a lot of valuable counter top real estate). If you wash your veggies ahead of time, they are ready to go when you are. PS – this only works for veggies that you store in the fridge, such as greens, broccoli, celery, carrots, zucchini, and green beans. Don’t go washing onions, garlic, or potatoes and please don’t store them in the fridge! Sometimes I’ll chop vegetables in advance, but usually I wait until the day-of to preserve maximum nutrients. Know that it’s better to have pre-chopped and actually eat them, than to skip out on eating produce all together. No I didn’t say ‘eat a salad’. Let’s be real here. Who really wants to eat a salad e-v-e-r-y day? I get sick of salads, so having cooked vegetables ready to go is a life saver, especially with my wacky schedule. Some nights I’m teaching Pilates or meeting with a nutrition client and I leave little time to prep my own dinner. If I have pre-cooked and delicious vegetables waiting for me, it’s as simple as reheating in the toaster oven and combining with whatever else I’m cooking up fresh, like grassfed beef or pastured chicken. This doesn’t work with everything (like greens), but does wonders with sweet potatoes, broccoli, cauliflower, onions, carrots, cabbage (really! ), fennel, bell peppers, celery, beets… etc. Root vegetables love to be roasted. You will find an excuse to not eat vegetables if they taste bad. Please cook them in some fat such as real butter, coconut oil, or olive oil. The nutrients in vegetables are absorbed better when you eat them with fat and not shockingly, they taste a heck of a lot better, too. Second, use sea salt and herbs/spices for flavor. Bitter vegetables, like kale and arugula, are nearly unpalatable without salt. My biggest complaint when eating vegetables away from home is lack of salt. Seriously. We over-salt so much food and then leave vegetables completely naked and overcooked. No wonder people *think* they hate veggies. When cooking, I usually use about 1 teaspoon of salt per pound of vegetables, though it depends on the type. I like to measure this because it’s easy to under or over-salt. And one last tip about salt – add it during cooking, rather than after, otherwise the salt granules just sit on top of the food and taste salty instead of enhancing the natural flavor of the vegetables. Stay tuned for next week’s post. I’ll be sharing one of my favorite roasted vegetable recipes. Let me just say, it has some international flair that even the pickiest eaters and self-proclaimed vegetable haters have raved about. Be sure to sign up for email updates so you don’t miss out. Do you struggle with eating enough vegetables or cooking them before they go bad? How do you manage to eat them in spite of a busy schedule? What vegetable prep tips do you use that others might find helpful? Help a friend out and share your input in the comments below. I love these ideas! I always have vegetables go bad before I get a chance to use them, so I started buying produce twice a week instead of once a week. I’ll definitely be using tip #2 and roast ahead of time.